I have always been in love with winters. The cold breeze, the deep blue sky and sometimes the violet sky to admire comes along too if I am lucky. I am missing my Californian Winters this year. I look outside my window and I see bright sunlight or rains pouring. I am kind of a winter person, I think. I love winter food, winter clothes, winter birthdays, winter sky, winter festivals, and my list goes on and on. Also, I love citrus. Citrussy cakes are sometimes all I want. 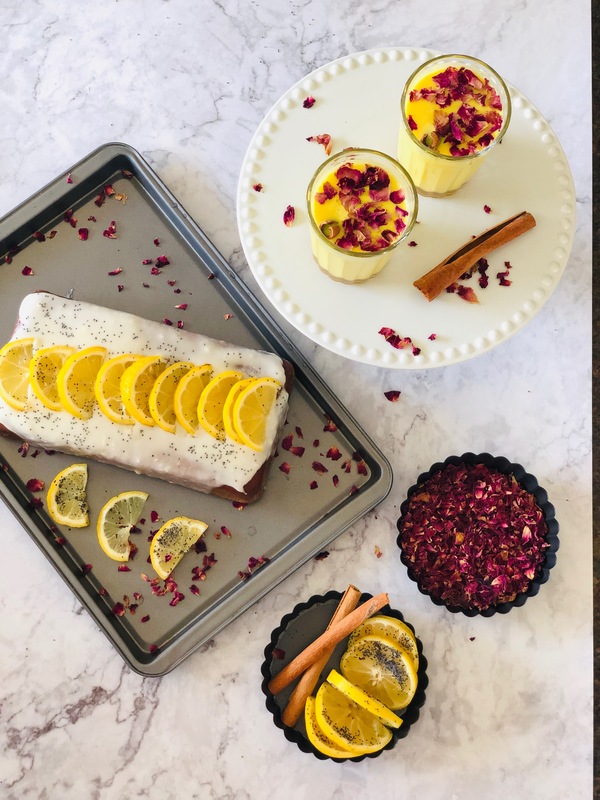 Today is the day to put a lot of citrus in my oven, and so I popped my oven with this beautiful lemon citrus cake with the side of turmeric latte. Isn’t this just awesome? Warm hugs from cake and a cuppa turmeric latte. Having a sweet tooth and trying to lose weight together just doesn’t seem to go hand in hand. But, I allow myself to relish a small piece of sugary delight sometimes. I try to bake at least once a week. It gives my soul a different kind of peace. For me, baking is more like meditation. If I bake, I have felt I have danced so hard to sweat it out, I have talked to myself just to clearly know what I want to do, it somehow gives me clarity and its beautiful. And so is the soothing smell of fresh bake from my oven. Today my kitchen is smelling great. It smells like citrus, dried rose and fresh bakes. I can’t tell how beautiful this feeling is. But, let’s get back to the recipe. This is a very easy bake with simple ingredients, but it tastes great. So let’s dig in the recipe. Preheat the oven at 325° F. Butter a loaf pan. In a bowl, sift and add flour, baking powder, and salt. In a big bowl add butter and sugar. Start whisking them either with a hand mixer or stand mixer until fluffy. Now add eggs one after the another while whisking. It is time to add flour and milk alternately. Gather the batter from the sides and give it one good whisk. Now add lemon juice and lemon zest while whisking. Once the batter is ready, add poppy seeds and fold the batter evenly. Pour the batter in the loaf/cake pan and bake it in 325°F for 60 minutes. While the tea cake is baking, prepare the icing. In a bowl, place butter and icing sugar together. whisk until soft. Now add milk and whisk again. Once the cake is cooled down, pour the icing on top. You can decorate the cake with slices of lemon and sprinkles of poppy seeds. This entry was posted in Dessert Recipes. Bookmark the permalink.